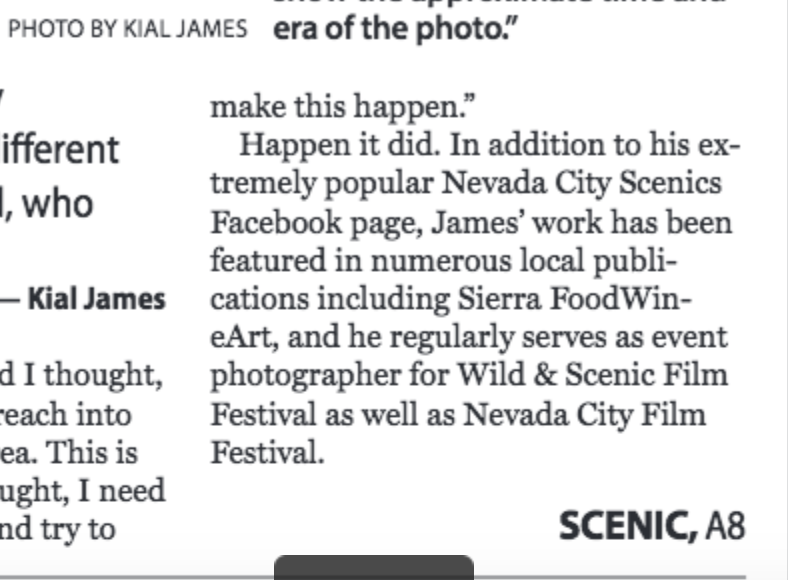 I was glad to read a front-page article in The Union this morning featuring outstanding local photographer Kial James, who is being honored by the Nevada City Chamber in January. We are big supporters of Kial and often use his work in our magazine, the latest example being the cover of the current issue. The article mentioned our relationship with Kial (a gracious gesture), except that the copy editor didn’t proofread the article closely enough before it was published, so it reads “Sierra FoodWin-eArt” instead of “Sierra FoodWineArt” — the proper name of this publication when we acquired it around a decade ago. Newspaper copy desks typically read photocopied “page proofs” of the daily edition before it goes to print, and that’s where mistakes like these are found and corrected. In this case changing the word “including” to “such as” would have shorted the line, so the proper name (in this case, our magazine) should have aligned correctly in the newspaper. Otherwise some more “wordsmithing” (such as shortening “numerous” to “many”) might be needed, so that “Sierra FoodWineArt” showed up on a single line (see below). There are a lot of gritty details in copy editing, that’s for sure. More details on this problem — “how to best break a word at the end of a line of text” — is here. Previous Previous post: Is Trump shorting the stock market?